In this short guide, you'll find the best places to stay in Tuscany, from top-rated hotels in Tuscany's popular hill towns and cities to agriturismo lodging in the beautiful Tuscan countryside. 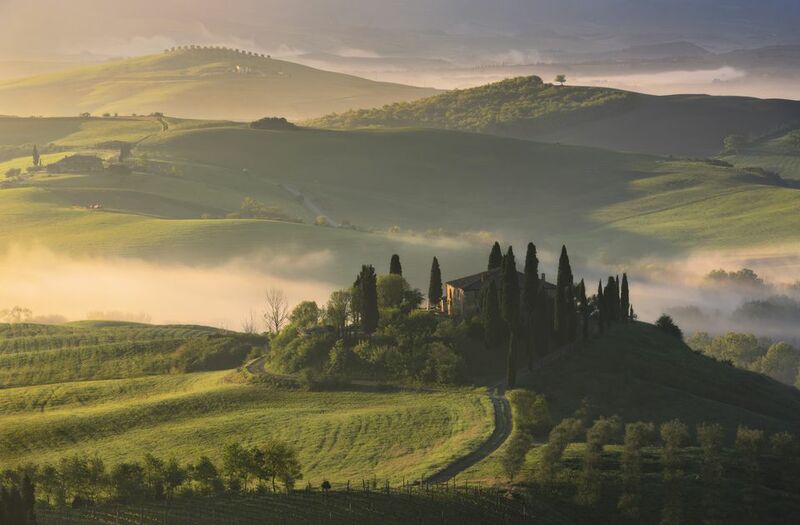 The Chianti Wine region of Tuscany, includes hotels in Chianti towns, agriturismo and bed and breakfast accommodations in the vineyards or countryside of Chianti, and even a medieval castle. The Chianti region is a beautiful area of vineyards and rolling hills between Florence and Siena, best visited by car. Cortona is a medieval hill town in Tuscany made famous by Francis Mayes in her book, Under the Tuscan Sun. It has many places to stay that are in or very near Cortona's historic center. Lucca is a small city in northern Tuscany enclosed by its walls. The city itself is flat so it's not a hill town but if you want to do some climbing there are a couple of medieval towers you can climb for good views. These hotels are either in the center or right outside the walls. The spa town of Montecatini Terme, between Lucca and Florence, is one of Italy's top spa towns. Hotels in Montecatini Terme are reasonably priced and many of them have a swimming pool, making the town a good base for visiting this part of Tuscany in summer. Pisa is the city in northern Tuscany famous for its leaning tower and the other spectacular Romanesque monuments on the square. Here are top-rated hotels, agriturismo lodging, and bed and breakfast accommodations for San Gimignano, a hill town often called the City of Beautiful Towers for its 14 surviving medieval towers. These lodging options are either in the historic center of San Gimignano or in the hills surrounding the town. One of Tuscany's most popular and largest medieval hill towns, Siena is famous for its exciting summer horse race, often called il Palio. These top-rated Siena hotels are either in the center or just oustide the city walls. Staying in an agriturismo, or restored farmhouse is a good option for exploring the Tuscan countryside by car. Accommodations range from rustic to luxury and are usually either bed and breakfast or a self-catering apartment. Tuscan farms often produce their own wine or olive oil so farmhouses are often in vineyards or olive groves. For a beach vacation in Tuscany or to see one of Italy's top carnival celebrations, the coastal resort town of Viareggio is a good destination. Most of these top-rated hotels are on the seaside promenade or near the sea and some have a private beach for guests. An abandoned medieval village in central Tuscany has been restored and made into a unique place to stay. Castelfalfi has a comfortable hotel, vacation apartments, villas for bigger groups, restaurants, shops, swimming pools and spa, and a 27-hole golf course. If you're traveling with family or friends or just want to experience a bit of life in Tuscany, a self-catering apartment or villa may be a good place to stay.